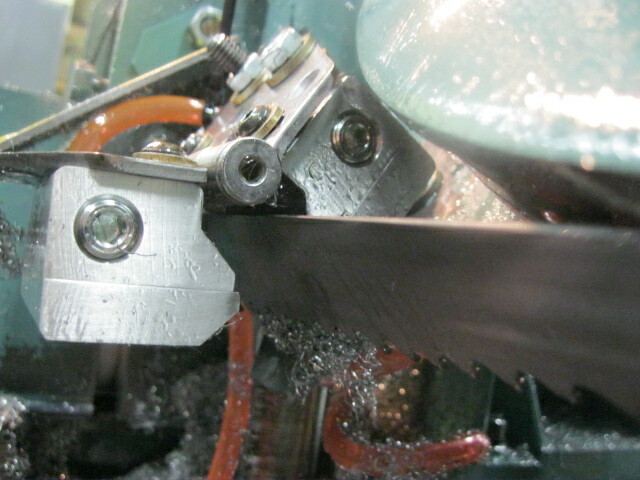 Super Air Knives remove chips and coolant from high speed band saw blade. *In the first week they had the saw, they went through four saw blades…when the teeth get clogged with chips, they don’t cut right; they get hot; and they fail. *The inability of the brush system to remove the chips caused them to accumulate in the belt pulley housings…operators were spending 2-3 hours A DAY just to shut down the saw and clean them out. *The excess of chips also caused the blade’s guide bearings to fail, which caused almost a day’s worth of down time to replace. *The Maintenance Supervisor was called to the saw repeatedly during the work day to address these, and many other minor, malfunctions due to the inability to remove the chips. EXAIR Intelligent Compressed Air Products have a long reputation for saving the day…thirty-three years and counting. How can we help you? Give me a call and let’s find out.